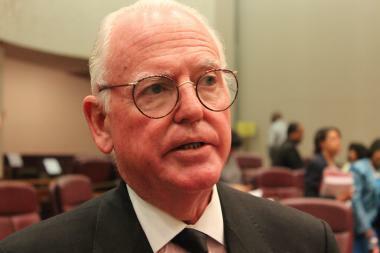 CHICAGO — The city's most powerful alderman — Edward Burke (14th) — introduced an ordinance at Wednesday's City Council meeting that would allow Chicago museums to display unloaded firearms for historical purposes. Currently, city museums are prohibited from lawfully displaying firearms of historic value, according to the city's long-standing gun ordinance. Burke said Wednesday he recently learned of the "anomaly in the city code." "Museums are caught in a dilemma that if they have in their collections artifacts that can be defined as firearms, even though there's historical significance to the memento, they can't be registered in the city and can't be displayed," Burke said. World War II Capt. 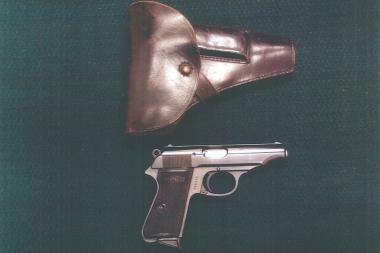 William Levine recovered this Walther pistol from a German solider during the liberation of Dachau concetration camp. The gun is currently not allowed to be displayed in Chicago. Burke cited the example of Major General William P. Levine, one of the very first American soldiers to liberate the Dachau concentration camp during World War II. Levine's family donated a German Walther PP he acquired during the war to the Pritzker Military Library following Levine's death in March, but the library is unable to display the gun under the current ordinance. A history expert himself, Burke said allowing museums to display firearms like Levine's is a reasonable exemption to the city's ordinance, especially given museums across the country are free to do so. "I think in Chicago, museums should have the same opportunity to display articles of historical significance even if they are firearms," he said. Kenneth Clarke, CEO and President of the Pritzker Military Library, said the current policy leaves Chicago citizens missing out on a lot of history. "It's about preserving the stories of citizen soldiers from World War II, World War I ... who have served our country," he said. Clarke said the current city code is unclear if historic guns can even be stored in the museum's archives, so the library has moved its collection to a fire-proof safe at a gun range in the Chicago suburbs. The library doesn't have the ability to store many firearms at that location, so it has had to turn away people who have wanted to donate their artifacts, Clarke said. "The reality is there are a lot of historic firearms sitting across the city in closets and attics that nobody knows what to do with. ... Who knows where they end up," he said. "If the city were to have this kind of ordinance, libraries and museums could be places where those firearms go and are taken off the streets and properly secured." The Pritzker Military Library has extensive security on its premises, just like any museum, Clarke said. "They are stored in conditions that are likely to be preserved for the long haul," he said. "You’re talking about something that is not very accessible." And even if someone were to get their hands on a historic gun, it's unlikely they'd be able to fire it. "I don’t know if someone's going to find ammo for a German handgun from World War II all that readily," Clarke said, referring to the Levine's pistol Burke highlighted Wednesday. Chicago has a well-known gun problem. Historic handguns aren't a part of it, he said. "There are so many firearms available on the black market in Chicago, it's not likely these are going to be high on the list," he said. "These aren't the guns they want." Burke's ordinance would allow museums to display "curios and relics" — historical firearms registered by the U.S. Department of Justice — if the council approves it. The Field Museum, one of the the city's largest, has a historic gun collection in its archives but has never considered displaying it, said museum spokeswoman Nancy O'Shea. "They're just artifacts in our collection," O'Shea said. "They can be accessed and studied [by] researchers who would find them interesting." O'Shea did not have immediate information available on what era the guns are from. Clarke said any guns from before 1898 are allowed for archives and display in the city. RELATED: Political ads banned from Chicago buses and trains.